One of the major Finnish musical talents of his generation, pianist Henri Sigfridsson (b. 1974) has performed at major concert venues and European music festivals, including Salzburg, Lucerne, Ruhr, Gstaad Menuhin, and Lockenhaus. He has appeared with numerous orchestras throughout Europe and Japan under the baton of conductors Vladimir Ashkenazy, Lawrence Foster, and Sakari Oramo, among others. Henri Sigfridsson has also given chamber music performances with artists such as Leonidas Kavakos, Gidon Kremer, Ivry Gitlis, Mischa Maisky, Patricia Kopatchinskaja, Sol Gabetta, and Johannes Moser. 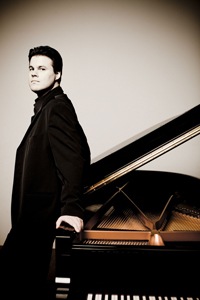 Henri Sigfridsson’s many successes in international competitions include First Prize at the 2005 Beethoven International Piano Competition in Bonn, where he also won the Audience Prize and the Chamber Music Prize. Earlier, he won First Prize at the 1994 International Franz Liszt Piano Competition in Weimar and at the 1995 Nordic Soloist Competition, and Second Prize along with the Audience Prize at the 2000 Géza Anda Competition in Zurich. During the 2001–2002 season, he was a scholarship recipient of the Mozart Society in Dortmund, and in 1996, Finland Festivals named him ‘Young Artist of the Year’. Henri Sigfridsson began his piano studies at the Turku Conservatory and went on to study with Erik T. Tawaststjerna at the Sibelius Academy and, in 1995, with Pavel Gililov at the Cologne University of Music. At the same time, he attended the master class of Lazar Berman at the Liszt School of Music Weimar until 1997. In 2011, Henri Sigfridsson was appointed Professor at the Folkwang University of the Arts in Essen.